Korallen-Zucht Flatworm Stop will help reduce parasitic flatworms on Acropora and SPS corals while strengthening all other types of corals. Dosage: 1 mL per 25 gallon tank water daily. Dose directly into the tank. Can be combined with Coral Booster for a strong synergistic vigor booster. Dosage: 1 ml per 25 gallon tank water daily. Dose directly into the tank. Do not exceed recommended amount. I started manual dosing this stuff with coral booster to combat aefw and never stopped. I'm in a 180 and first thing I noticed after the first few doses were my colors were popping and my growth exploded. I'm on my 3rd big bottle now and have both of them on custom stir plates I made and on a apex dos. I just do half dos of the coral booster daily and full dose of this daily. I even accidentally had a gravity feed of it into my reef of about 500ml and it bleached some corals but they were so healthy that a 30% water change and fresh carbon cleared it back out and the corals all survived and colored right back up but never stopped growing. I added this because I had an empty dosing head and I’ve found my sps have been doing great. I run a lot of different things so it’s hard to say if it actually does anything to be honest but it does seem to promote sliming for my acroporas which I do know is a healthy response to stress like fragging. I like it as a prophylactic regime for my tank. I use this everyday. Prevention of aefw & common fw. I have many established colonies I've had frag size and I do not want fw in my system. I had the tiny brown fw. I knew that if I did not do something they would get worse. Started dosing fws and they are near zero, this took approx 2 weeks in. This stuff is great combined with coral booster and a melanarus wrasse. It keeps the worms in check and corals stay healthy. It does not kill them so don't expect miracles just makes the acros not taste good. So still dip your corals and try to illuminate them before going into your display. But if you have a lot of acros and pulling off the rocks is not an option this works wonders. Second bottle I have bought, this time I got the 500 ML So it must be good. The product definitely keeps the flatworms in check. I prefer to use this product that strengthens my corals verses the other alternative. Started using Flatworm Stop about 8 months ago when i started noticing flatworms doubling by the day on my mushrooms and LPSs. Starting dosing this and I definitly noticed it inhibited the number of flatworms growing in my tank but did not get rid of them. All of my mushrooms, zoas, LPSs really started showing signs of good growth and their colors really started to show. Seems like if you can see 1 flatworm, there's 99 that you can't see. I've ride nukeing them with eXit, and they keep coming back. I've put a six line in the tank and he does a good job, but never could keep up. Then I found that the only real worry with these cockroaches of the reef tank is their appetite for acropora (and human flesh. Yes they sting and it's unpleasant). So I found Flatworm Stop. I'm a big fan of K-Z products, so I gave it a try. SUCCESS! The Acros look better than they ever have and the flatworm population is way down. Seems the 6 line can finally stay on top of them. Great line of products that I would highly recommend to anyone. I thought one of my acro's was dead, I've been using this for a week and it's coming back to life, great stuff! I started using this product about 3 months ago because of an outbreak of monti eating nudis in my tank. Coincidentally its been at least a month where I havnt seen a nudi in the tank, and the montis that were affected seem to be coming back strong. I did not dip any corals and really have done nothing else to combat the MEN. I would recommend this product. BTW I have around 25 different Acros and assorted sps and have noticed faster growth when adding this product combined with coral booster. When treatment ( minimum 3 month ) need turn off Protein skimmer,UV,media reactor...? My reef tank water change 5% every week.Need water change or not ? Thank you very much ! You will not need to adjust the media, UV or skimmer. These will be absorbed by the acros and make them repel the flat worms. Regular water changes can continue as scheduled. Great Question! I have been using this product proactively for about 3 months and have not had any issues with the fish in my tank, consisting of tangs, triggers, anthias, and a few others as well. Great question, as far as we are aware we have yet to find a case where flatworm stop has effected fish. If you have a specific concern we highly recommend giving the manufacturer a call. Refrigeration is not necessary for Flatworm Stop. This will work by targeting the acropora and treating them to resist the flatworms and starve the flatworms. Rather than trying to treat the flatworms directly. Feel free to let us know if you have any further questions! This is designed only for use against flatworms and no further information has been given about other parasites being effected. 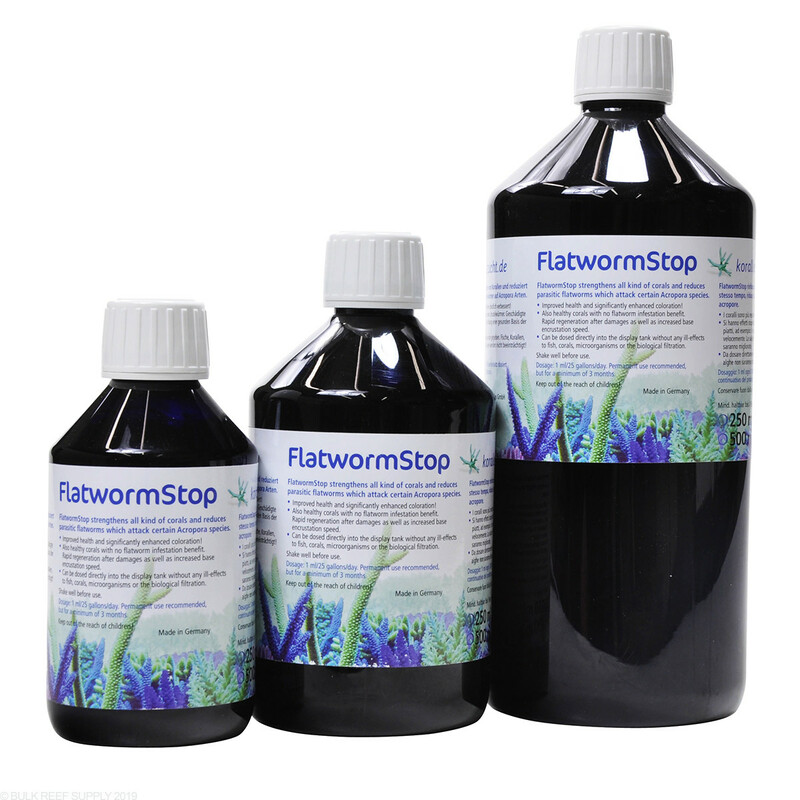 The manufacturer only lists as a treatment for flatworm. Feel free to let us know if you have any further questions! 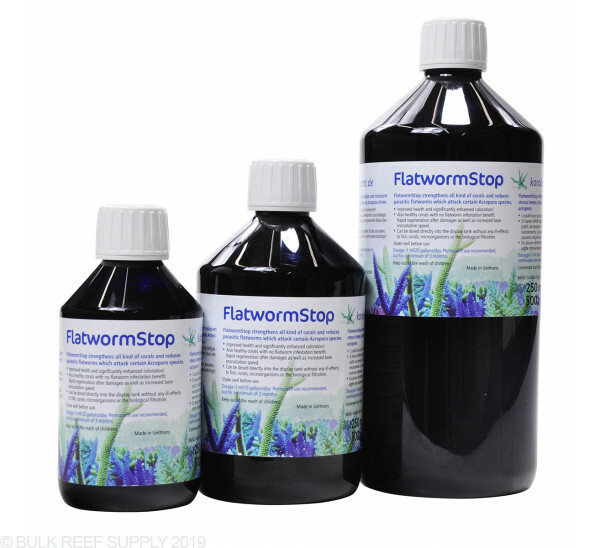 This will help reduce almost every type of flatworm, however, it is not 100% guaranteed that it will remove them. In most cases, once you have flatworms it is more about keeping the population in check. In most cases, a wrasse or other fish that eats flatworms can give huge benefits as well. Just wondering if this stuff will starve Out Acro eating flatworms regular flatworms?Just wondering If anybody experienced total devastation to the flatworm seeing no more flat worms in the tank after long term use.I would think that this product from what I'm hearing with keep the flatworms from being able to eat or feed or any Coral to be exact. We have found flat worm stop to work really well on our systems in house. As to the method of eliminating the flat worms unfortunately the information provided from KZ is not as detailed as desired. From our understanding the flat worm stop will have an impact on the corals directly which can lead to the flatworms starving. Feel free to let us know if you have any further questions!